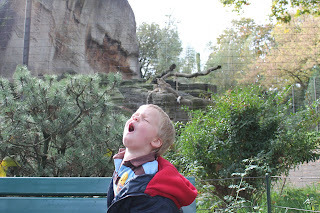 Basel Zoo, call to the wild! One of the best purchases we make when we travel to another city for several weeks is a membership to a local attraction. In LA it was Six Flags, in Houston it's the Children's Museum and the Arboretum & Nature Center, in Basel it is without a doubt the ZOO. 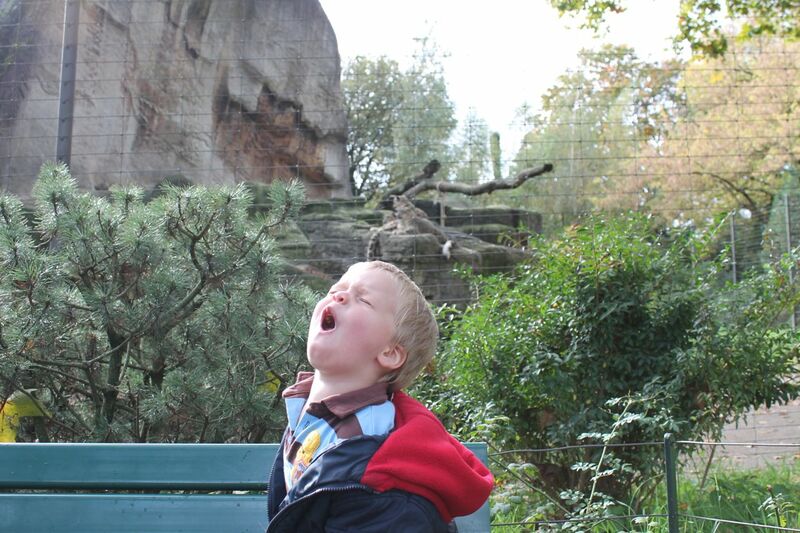 If you don't already belong to your local Zoo, you should. Join today. 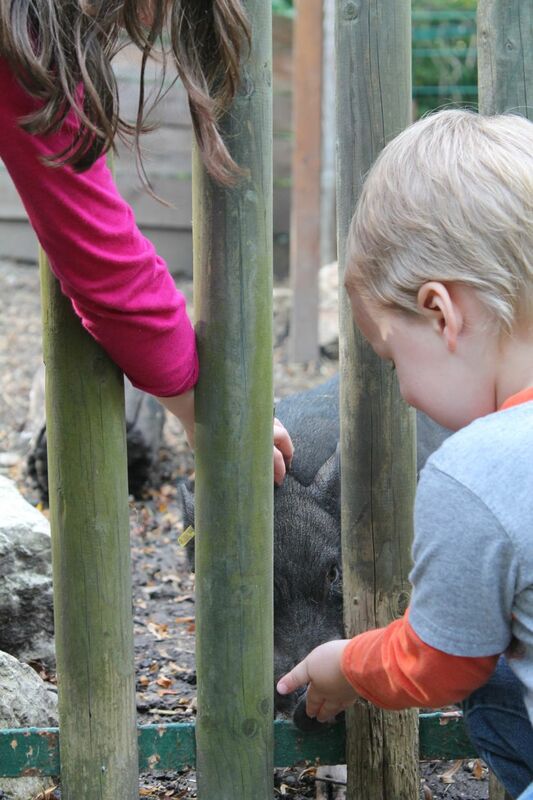 Our children love to play outdoors and right now and much of the year we don't have a yard so my solution is the Zoo. The Basel Zoo has a family of peacocks that roam freely through out the Zoo. They have two entrances and are within walking distance from downtown and near three tram lines and four bus lines. At the Zoo, go see the baby rinio, pet the goats, and see the new primate exhibit. Pack a lunch, stay all afternoon and look out for us, we're probably there. The photos that keep popping up on my random screen saver are from almost a year ago when we were in Manhattan for Ryan's debut at the Metropolitan Opera. Sadly, none of them are of actually of Ryan or the Met, but with the terrible weather and hardship facing a city I love, I wanted to write about it now. Manhattan will always be a home town for us. Ryan and I met and married there and we have many friends who call it home year round. Plus we are there quite often. Some of our favorite places are in New York City. One of our best days was last fall when the kids and I decided to walk across the Brooklyn Bridge. Have you ever from need or desire walked to Brooklyn? Well, technically we didn't either. We took the A train to the City Hall stop and followed the easily marked signs to the bridge pathway (with our stroller) and walked to Manhattan. It was a beautiful view, and we didn't even let the over-zealous-bike-messengers impatient attitudes with all the tourists in the world and anyone else who happens to be directly in front of them, turn our trip sour. We saw barges and because my children sing all the time and everywhere they go, they immediately began singing "barges, I would like to go with you, I would like to sail the ocean blue." I should have put out my hat for tips. We had an unobstructed view of Lady Liberty and of Staten Island and Governors Island and talked about the history of each. Upon reaching lower Manhattan there isn't a ton of things for kids to do, other than the random neighborhood playground, so we headed up to Central park, via the subway, and played at another of our favorite spots, the 69th street playground in the park. There are always lots of children to play with but on that day a very fat Raccoon came also. It was huge and terrified the locals. Right now we are in Basel, one of Switzerland’s largest cities. 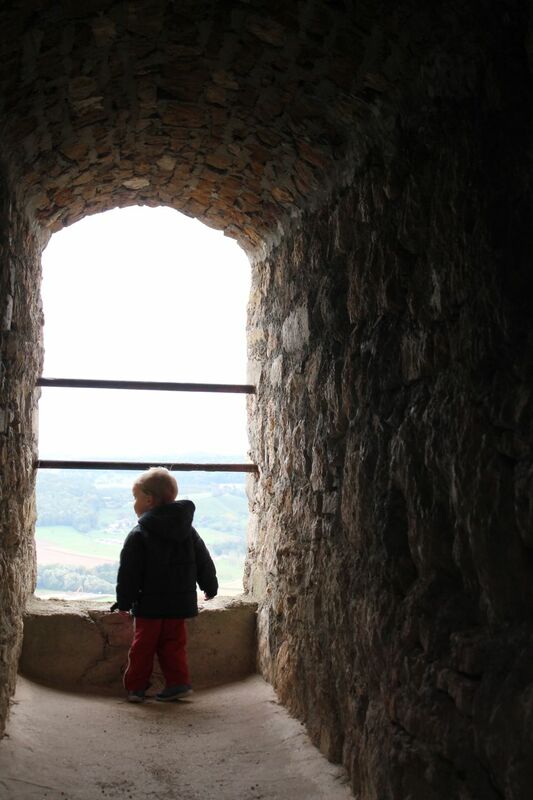 It is centrally located in the heart of Europe, with both Germany and France within walking distance or a short tram ride away there are many opportunities for family fun day trips, learning travel experiences, and of course a castle or two. If you are thinking about traveling here do the suggested things to do, take a boat ride on the Rhein visit the Zoo, take in a castle ruin or local Schloss. 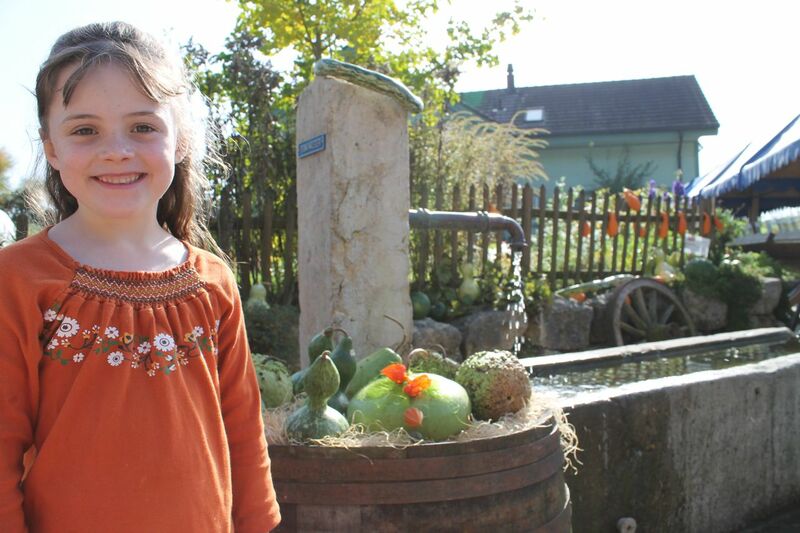 However, some of the best things for kids are hidden within the local landscape of Basel. Almost by accident we discovered the Robi Daronga Spielplatz. From the website it might not look like it would be worth your time and deciphering the Swiss German language isn’t easy. But don’t be fooled; it is an absolute Neverland for children of all ages. The Robi parks are sponsored by the city and by a once a year donation of 60 CHF by local families. It’s open every afternoon and has festivals to celebrate the seasons and holidays, clean bathrooms, an indoor play area with a complete kitchen, a woodworking shop, an instrument barn to try your hand at being in the band and perhaps most importantly it’s designed by kids for kids. The staff will help the children design, construct, and paint new structures in the forest to promote play. When visiting with one staff member, he explained the concept to me like this; “it’s just for play. 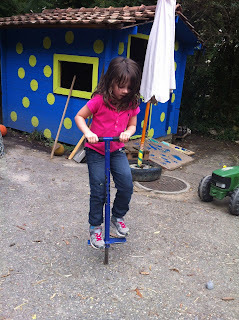 School is very rigid and here children can explore their own imagination.” My children have brushed the live Hogs,helped to paint the toy shed, and tried out a pogo stick for the first time. It’s no wonder that we go back anytime we’ve got an hour or two to spare. Next week, we will attend the first annual Halloween party. Just a short tram ride away from our temporary housing in Binningen, Switzerland is the small village of Leymen, France, we don't even change trains to hop from francs and Swiss German speaking Switzerland, to Euros and French speaking Leymen. This cute little border town isn't even large enough to warrant a border guard, gate house or passport control stop, only a small sign letting you know when you pass from one country to the next, much like when you leave Oklahoma and head into Arkansas. 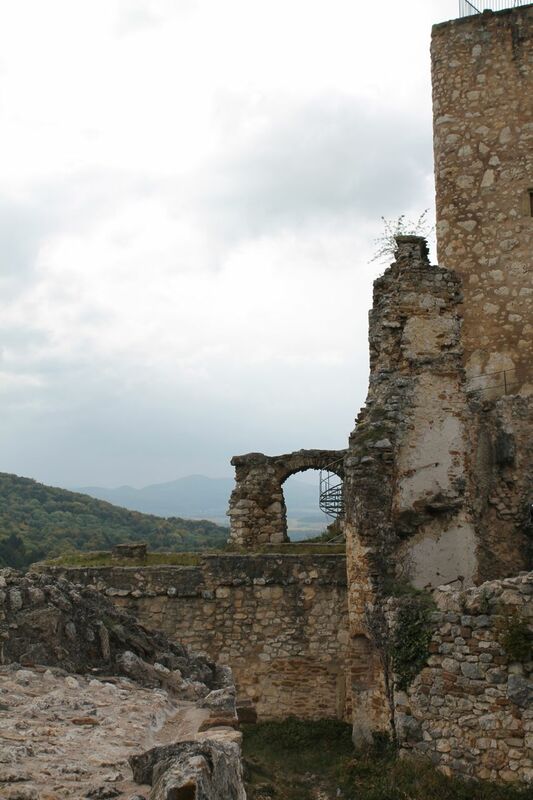 Just a short walk up from the tram stop you'll find three paths to take to the top of the hill to the ruins of the Landskron Castle. We took the intermediately steep path which is wide enough for our stroller and very scenic, however the road is also available for car travel. We don't have a car so it was the 40 minute hike for us, but considering it was the first of October and early fall walking through the forest of colors was a real treat. Plus we got to see a pick your own pumpkin stand, where you pay for what you take using the honor system. The children were enchanted and a little tired by the time we reached the top. or to la Couronne d'Or down the street for a fine french dinner without the kids. The last beautiful indian summer sunday before it started snowing we walked to the nearby Mathis Bråndelistal-Hof. What a treat and surprise this oasis on the hill top was for our family. The farm is family owned and accessible by car and local bus, though we walked the whole way. 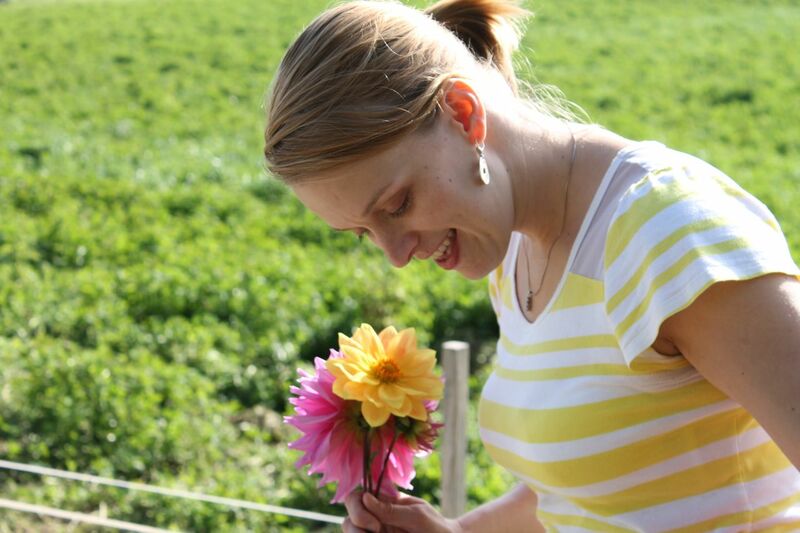 Once there you can pick flowers in the cutting garden, or let your children enjoy the two different playgrounds, or run and hide in the corn maze where at every dead end there's a small play area and so each ending feels like a destination and you'll want to search out those as well as your way back out of the maze. 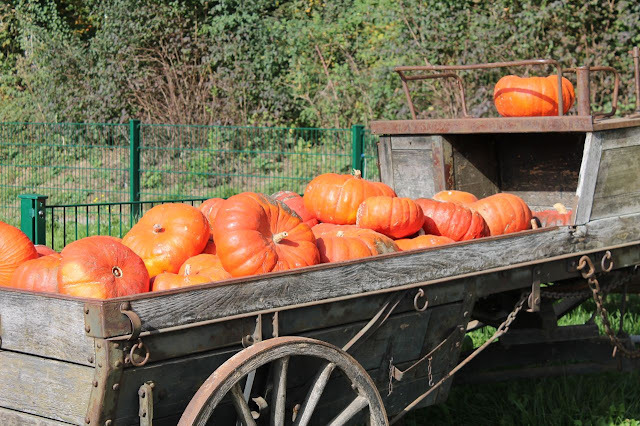 We bought fresh gords and pumpkins and saw more variaties for sale then I had ever dreamed of finding. We also bought four of the best tasting apples on the earth and some apple schnaps. They also sell firewood for your wintertime picnic at one of the many camp sites along the walk, we saw families and friends doing just that and made me wish we'd come prepared to stay longer. Next time we go I shall do just that. This trip was a fantastic, lazy, and exciting way to spend a family sunday. Traveling like a native Switzerlander or whatever, wherever we go is always a fun challenge. Last week we traveled from our current home base in Basel, Switzerland to the resort town of Lucerne, Switzerland about an hour away. 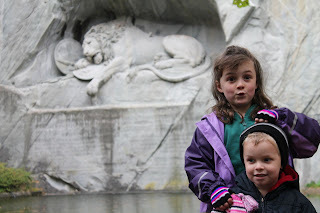 We bought the round trip train tickets that morning for both Ryan and I and the kids were free (Family of four travels in a second class car for 120-CHF) Then in Lucerne we walked around the idyllic lake town to the Lion monument (Löwendenkmal, free) and then had a picnic on the water front. Lucerne is an ancient town with medieval ruins littered about town. There's a historic part of town just a short walk up from the train station. 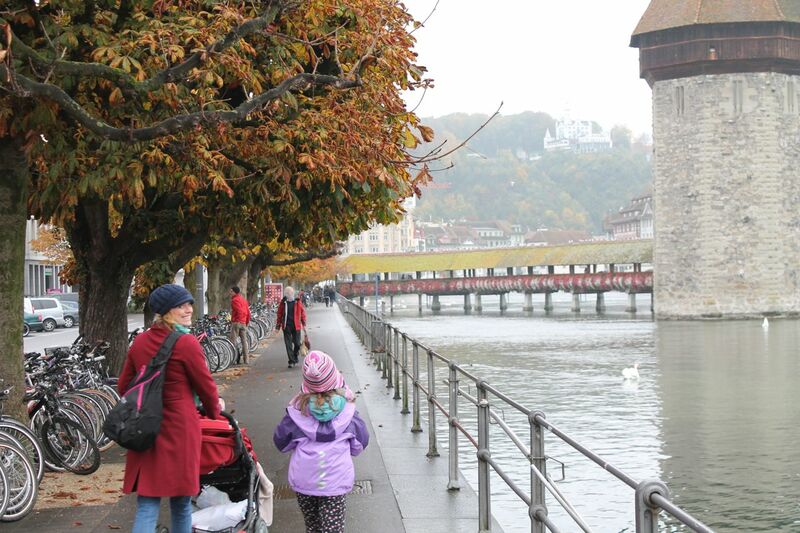 We walked along the lake shore and across one of the many bridges that are an integral part of downtown. After a small lunch, we took the local train over to the only working artistin glass factory in Switzerland. Check their website here. 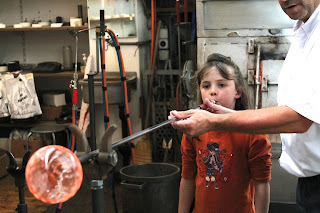 The tour is free and for a 15-chf charge my daughter got to blow her own glass christmas ornament. We took time to watch the highly skilled artist create plates, candles and pictures for their store for the Christmas season. Next we went into the glass museum and walked through the glass labyrinth, saw a fairy tale with glass and mechanical puppets, and played outside at the playground on the water front. 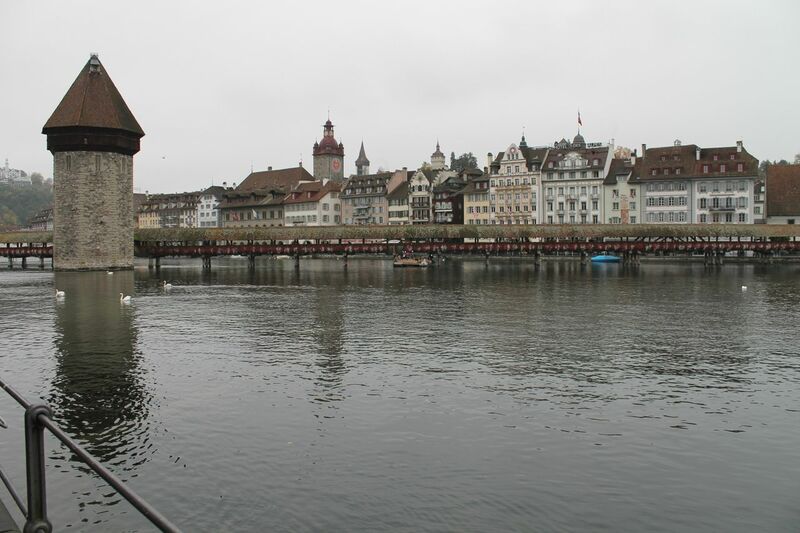 Next time we go to Lucerne, I want to take a cruise on Lake Lucerne. There are many different experiences available, from a 5 1/2 hour dinner tour of the lake and surrounding towns to a 1 hour panorama yacht cruise with audio guides. As you might guess this would be a more expensive way to see the city. There is also the famous cogwheel railway up to the top of Mount Rigi and return by cableway or cruise. As it was an overcast day and my dear husband is uneasy with heights we didn't bother with this option, though I'm keen to try it next trip. Traveling the world with a family of four, eating new things, making friends, taking a whole lot of pictures and writing just for fun.